Important note! This guide is made for setting up environment for local development. Don’t use this configuration on production environment as it can lead to security risks. Linux is THE platform for developing web applications. I don’t want to start platform war, there are plenty of options that does the job well. But developing stuff on platform which is ran on production environment is the best choice for learning how stuff works. 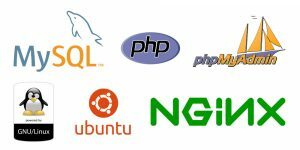 This guide will show how to install nginx, PHP and MariaDB (drop in MySQL replacement) and configure everything for local development. Major requirement is to have Ubuntu 16.04 or higher installed, or any other Ubuntu based distribution which uses apt-get as package manager. For the sake of simplicity, first we’re going to install everything, then we’re going to configure it to all work together. If you follow everything, you will have nice start for easy local development of PHP applications. Also, when you type localhost in your web browser address bar you should see Welcome to nginx! message which confirms our HTTP server is working well. There are few important things to know about nginx. Main configuration file is /etc/nginx/nginx.conf. Another important part is setting up server blocks (virtual hosts in Apache world). All of the available server blocks are located in /etc/nginx/sites-available directory. To activate available server block configuration we need to create symbolic link in /etc/nginx/sites-enabled. More on adding server blocks will be in upcoming sections of guide. Check if MariaDB is installed by running mysql --version. Now we can modify nginx configuration. We need to change first line from user www-data to user your_username. In my case I changed that line to user ivan. You can close and save file by pressing Ctrl+X. Now we need to restart nginx to reload new configuration by running sudo systemctl restart nginx.service or sudo systemctl reload nginx.service in terminal. Close and save with Ctrl+X and run sudo systemctl restart php7.0-fpm.service to reload new configuration. Don’t forget to write your user name on relevant place. Close and save with Ctrl+X and run sudo systemctl restart nginx.service to reload new configuration. This one is easy. Open your terminal and run mysql_secure_installation. Just follow all of the steps and you will properly set up MariaDB. Let’s create index.php file in ~/projects directory and run phpinfo() function. Run printf "<?php\nphpinfo();\n" >> ~/projects/index.php to create and populate new file. Now check localhost URL in your preferred browser and you should see information about your PHP installation. That confirms that everything is set up correctly. Rest of the guide is not mandatory but it can make development much more easier and enjoyable. sudo sh -c "echo 'xdebug.remote_enable=1' >> /etc/php/7.0/mods-available/xdebug.ini"
It’s up to you to integrate Xdebug into your IDE of choice. PhpMyAdmin is a great web-based DBMS interface. I prefer to install it by pulling latest version using git and using composer to install dependencies. Run sudo apt-get install git to install git and follow these instructions to install composer. Note for composer: it needs to be available as global binary so you can run it anywhere. Now run git clone https://github.com/phpmyadmin/phpmyadmin.git ~/projects/phpmyadmin to get source files for phpMyAdmin. Then cd ~/projects/phpmyadmin && composer update --no-dev to install all of the dependencies. Getting phpMyAdmin git repository may take a while so be patient. When dependencies are installed you can go to http://localhost/phpmyadmin/ and use phpMyAdmin. Every time you want update phpMyAdmin you should run git pull && composer update in terminal. Next we have to tell nginx to load new configuration. We need to create symlink like this: sudo ln -s /etc/nginx/sites-available/phpmyadmin /etc/nginx/sites-enabled/. Then we have to restart nginx to activate new config by running sudo systemctl restart nginx.service. Final step is to edit /etc/hosts file and add 127.0.0.1 phpmyadmin.dev line. Now open phpmyadmin.dev and enjoy in your phpMyAdmin installation. Improvements never stop. There are many ways how you can improve your set up. Consider this as a starting point for development without classic hassles. I would like to improve this setup by adding easy PHP version switching. Also, having this setup available for all users on machine would also be a plus. But right now, this should be enough for most beginner developers. Hope it helps you! Please comment if you have trouble with something. Thanks for reading. Awesome! Very nice and clean guide to installing and setting up nginx. Seems like configuration files of server blocks are simpler than virtual hosts in Apache. Also, after reading this it looks like nginx is pretty simple to set up and maintain. I will definately try setting up my own nginx environment by following this guide! Good luck mate with next articles & keep up the great work! Yeah, nginx is actually simpler to setup than Apache (at least in basic scenarios). I am not able to make PHPMyAdmin to work from http://phpmyadmin.dev/ instead of http://localhost/phpmyadmin/. Could you please check if server block given for this purpose is correct?